Anyone thinking of doing Southern Ranges and PB, I hope you may find some useful information here. Five of us flew in to Hobart from Adelaide on 21st Feb 2017. Dennis from Huonville / Geeveston Taxis (0427971015) picked us up from the airport right on time. He had previously stopped at Anaconda to get some gas for us as we arrived too late. He took us to the Huonville Grand Hotel where we stayed that night after grabbing last minute supplies at Woolworths (Huonville). Accom is about $35 ea per night. Twin rooms. Good meals and friendly staff. Dennis picked us up the next morning about 7-30 and took us to the Old Quarry Road, start of the Southern Ranges Track. Total taxi fare was $340. Day 1. We were hoping to make it to Pigsty Ponds but one of the guys in the group didn't fill up with water at the first creek (5 mins in). 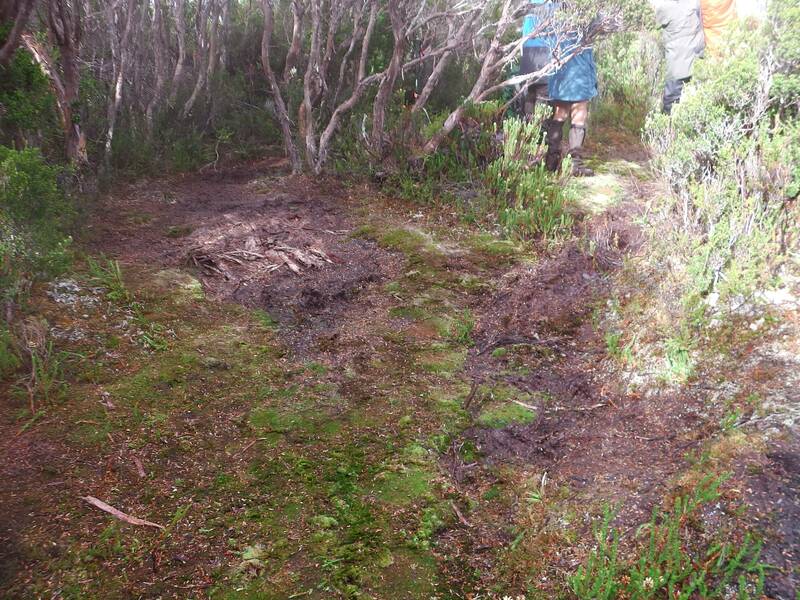 It was a warmish day and by the time we made it to next decent water supply (Bullfrog Tarns) the damage was done. He started falling further behind and we pulled stumps at Hill 1/2 Saddle. Good water supply. Beautiful night but wind picked up about midnight. Day 2. Up early and on the track before 8am. Short day to Pigsty Ponds. Weather was ordinary. Light rain, windy and cloudy. Mt LaPerouse was hidden.Good water supply. 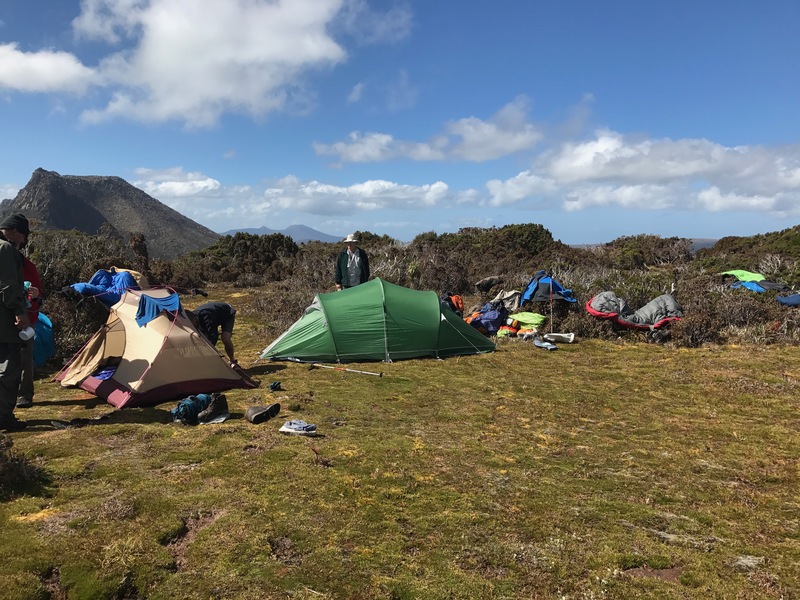 Stopped at a disappointing Smiths Saddle campsite. Squeezed 3 tents in with mine pitched on sodden ground. Limited water along the way. Fill up at Ooze Lake. Day 4. Up early again and on our way before 8. More scrub! Still cold and windy but with the occasional sunshine breaking through. Stopped for lunch just before Mt Whylly. Sun started poking through a bit harder. Pushed on through light scrub after sidling Mt Whylly and made it to Whylly Plateau by early afternoon. Nice wide open area with plenty of good tent sites and wonderful views although I wouldn't want to have been here on a windy night! Wind had dropped off completely, sun came out and we decided to stay the night here. Dried out all our gear and had relaxing afternoon. Reasonable water supply but probably not good after a dry spell. Fill up along the way at any opportunity. Day 5. We needed to make up a bit of time today so we pushed through to the top of PB. Lots of scrub! Karemucha Moraine has plenty of boulders to scramble over. Had lunch at Low Camp. Took the wrong track to PB and wasted about 1/2 an hour before getting back on track. 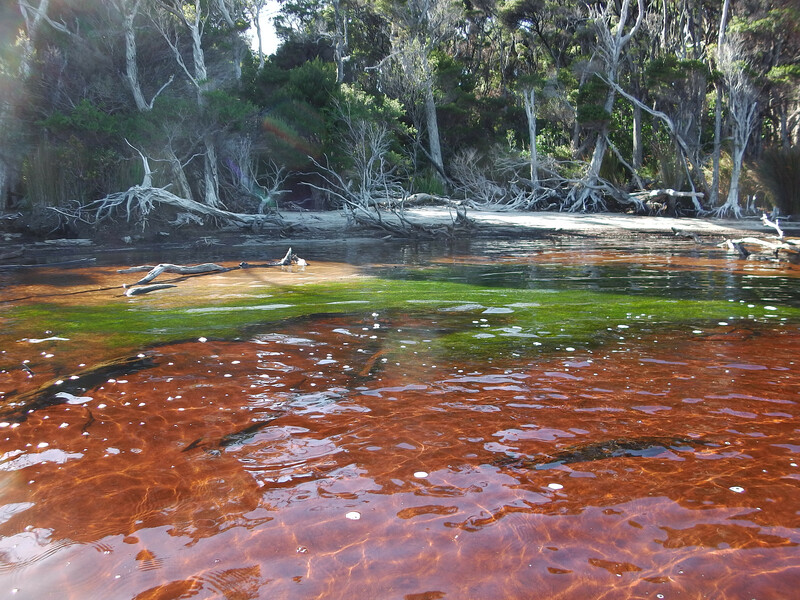 Limited water from Whylly Plateau. Topped up at the waterfall as you begin the steeper ascent up PB. Reasonably straight forward climb up PB. A little bit of scrambling but nothing too scary. Poor tent sites at Plateau Camp. Plenty of space but rocky, tree roots, and sloping. Weather was sensational, not a breath of wind all night. Great views 360 degrees. Average water from a soak on the track to PB summit about 50 metres south of campsite. Day 6. Down the other side. Reasonably straight forward. I was a little worried about dropping over the edge but it is deceivingly less steep than the ascent. A couple of nice little spots to stop as you make your way along the base of the cliffs. Fill up with water at the waterfall as there is no water until you reach the creek at the bottom. Long hard haul down to Cavern Camp. Be careful as you reach the limestone rock toward the base. Even solid looking ground can be a hole full of leaves and mulch. One of our group was very lucky not to break a leg when his foot disappeared into a hole. We did plan to make it to Prion but we'd had enough. Caven Camp is nice except for mozzies, good flat tent sites. Cooked dinner on the banks of the Lagoon with a light breeze keeping the Mozzies away. 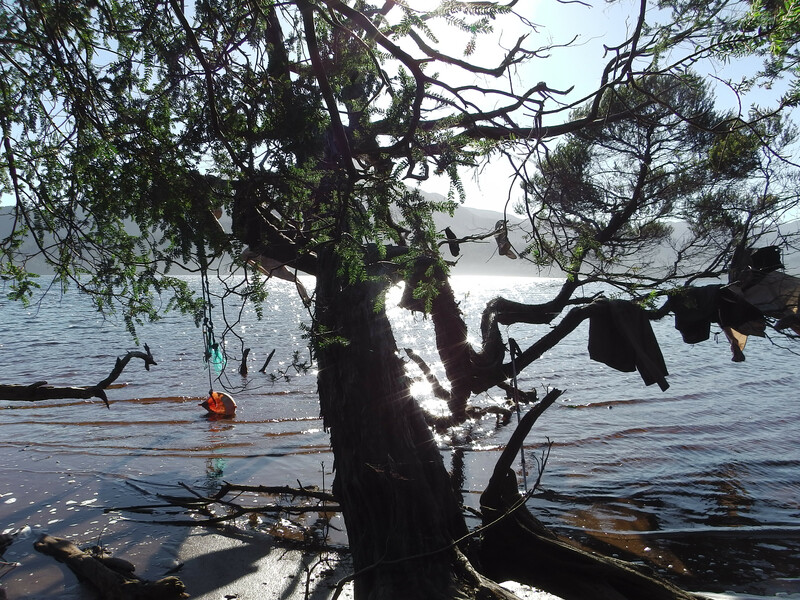 Day 7.Waded down a low level Lagoon in the morning. Really pleasant in nice weather with low water level. Rocks eventually give way to a nice flat bottom. Spend as much time on the shore as possible. Cutting corners does not work. Managed to cross the main creek by wading out a bit further. Just on testicle depth! Two of our party went inland to cross the log but this took them about half an hour longer! Took about 2 hours to reach the boat crossing. 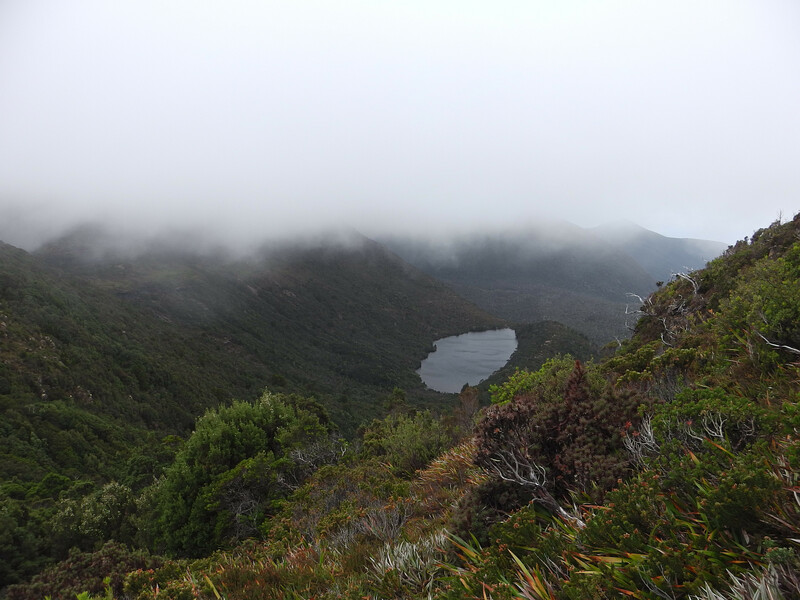 After crossing Milford Creek, the South Coast track has been rerouted through Melaleuca Scrub. They have done a very poor job! Really hard slog pushing through. We saw a large group head past the boat crossing to the end of the sandbar where they waded across the river at about chest deep. If the weather is nice (as it was) this is a far better option! Made it to Surprise Bay that night. Day 8 & 9. Spent the last 2 days heading out on South Coast Track. Rang Dennis when we came into phone range near Cockle Creek (Telstra only) He picked us up and took us back to Huonville Grand hotel and the on to Hobart the next day. Again it was about $340 for 5 of us. In retrospect. 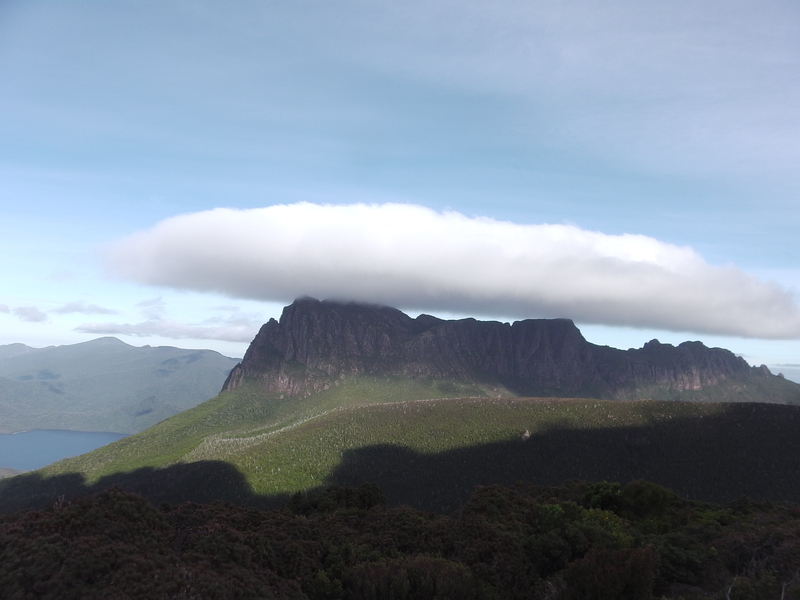 I have done the SC Track, Western Arthurs, A few trips around The Walls, Mersey Valley, Never Never and Overland Track. (If you want to know anything about that area, I should be able to answer most questions.) 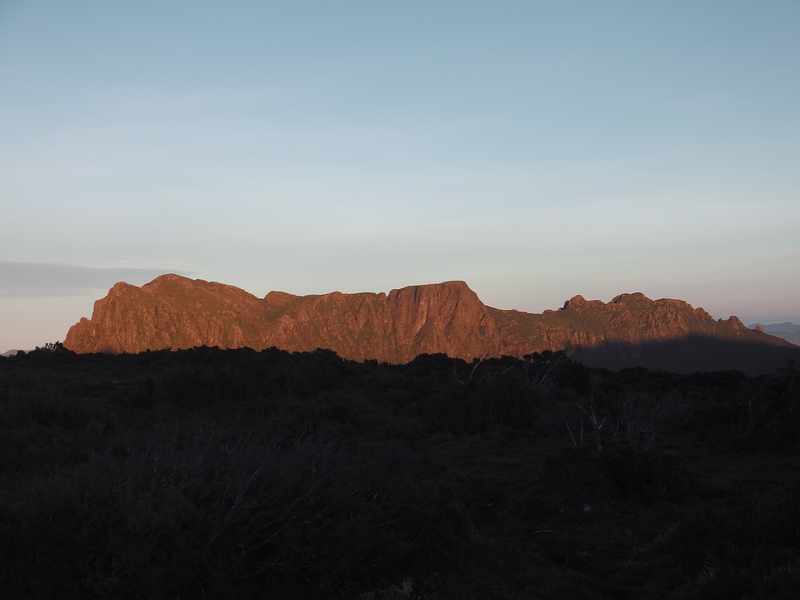 The Southern Ranges was by far the most demanding walk I have been on, but probably the most rewarding. Keep your pack light! Last edited by relaxtec on Mon 13 Mar, 2017 8:52 pm, edited 2 times in total. There's a trick to picking up the route from Low Camp when heading up to PB. Worked it out this time (going the other way helped). You probably followed the line I did first time through; the continuation of the pad from the camp is clear enough, but there's a turnoff to the left a very short distance on, and it is neither marked nor clear. Obvious when you're coming down - one of the very few spots where going in the other direction is easier. The re-routing from Eastern Prion to the Milford crossing is supposed to be temporary. Agree, it's a sod of a thing to get through. Presumably the old straight track will eventually be reinstated but that will take time (if it does ever happen). I have no idea where you camped on Smith's Saddle. When we passed through, nothing seemed viable - let alone a spot for three! What happened day 2? Very short day? Did you do any side trips? Did you get up to PB summit? There used to be a track cut fairly straight, just up the hill east of the crossing, to the Eastern Prion campsite. It did undulate a little from memory, but nowhere near as much - neither as steeply or as many ups and downs - as the current alignment. It's been trashed by storms - mainly fallen timber and erosion, I think - and Parks just found it easier to cut a new (supposedly temporary) line, further inland. It's jungle gym territory, the new bit. A lot of short, steep climbs into and out of narrow gullies, and a minimum of actual cutting, so you're continually clambering over and squeezing past the trees. Re Smith's, there's a viable tentsite near the middle of the saddle, big enough for a large tent or two small ones. It's just to the side of the pad, I think. Anywhere else on the saddle would be wet and lumpy. Day 2 was quite short. Weather was poor. We thought about trying to make Ooze lake but as it was described as an exposed campsite, we thought we'd stay put at Pigsty, hoping the weather would clear. 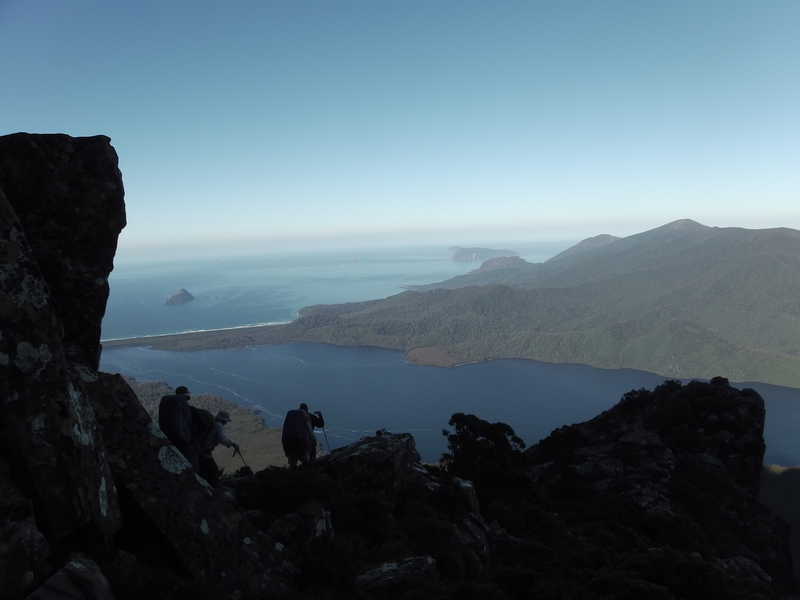 It turned out worse but we had more time to make it across to Smiths Saddle out of the wind. Smith Saddle. After packing up in the morning. A little sun poking through. If you blink, you'll miss it. There was a little more space scattered around but no great spots for a tent site. A few of the group went up LaPerouse. but the best pic they got was a foggy pile of rocks. We did make it to the top of PB on a beautiful evening. We also got to the top of Whylly but the track almost goes over the top anyway! Milford Creek to Prion Campsite new track starts about 50m upstream from the crossing. I don't know why they didn't use the chainsaw a little more. It is like they weren't allowed to cut any branch or trunk over a certain size? It took us about 45 mins to travel about 500 metres! I'm not having much luck adding photos. Anyone got any suggestions? relaxtec wrote: We saw a large group head past the boat crossing to the end of the sandbar where they waded across the river at about chest deep. I'm not as familiar with SCT as some of these guys, I'd imagine there's some pretty strong currents coming out of that lagoon. Seem to recall a sign (perhaps just on the western side? ), warning specifically not to cross from the end of the sandbar? You'd have to be sensible about it. There had been little rain and the creek was flowing quite slowly at the recognised crossing. Ideally cross just at the the change of tide as it is on it's way back in. Pretty safe. Some pics. Hope this works. they're in a bit of reversed order. Amazing! Looks like there was at least a few good spots of weather towards the PB approach and down the other side + lagoon. Stunning stuff. Especially like the photo of PB with the cloud above it! Really can't complain too much. Out of the 9 days, there were 2 bad days. For the South West, that's pretty good. 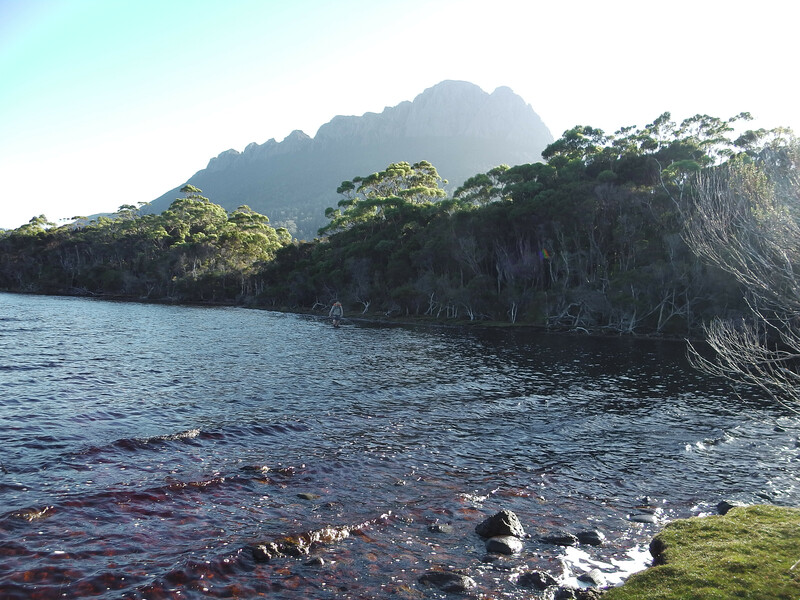 We went swimming on a few occasions which I have never before had the pleasure of doing in Tassie because it has been too cold. The photo with the cloud above PB is pretty cool. It was quite early in the morning and we watched it form as we were leaving Whylly Plateau. It didn't hang around long. 2/9 is great! Very jealous. We got about 6/8 bad days, which was not pleasant. Though we did get a lovely day for the trip down New River Lagoon - which was fantastic. Thanks again. I love reading about walks, and the PB loop is a personal fav. Tried to suppress the urge, it refuses to lie down and die . . . There. Is. No. H. In. Wylly. Great notes and enjoyed reading the thread. I have done this route 3 x times in the last 7 or 8 years. Def one of the harder " alleged tracK" walks I have done. Thanks for posting looks like a great trip with typical weather! 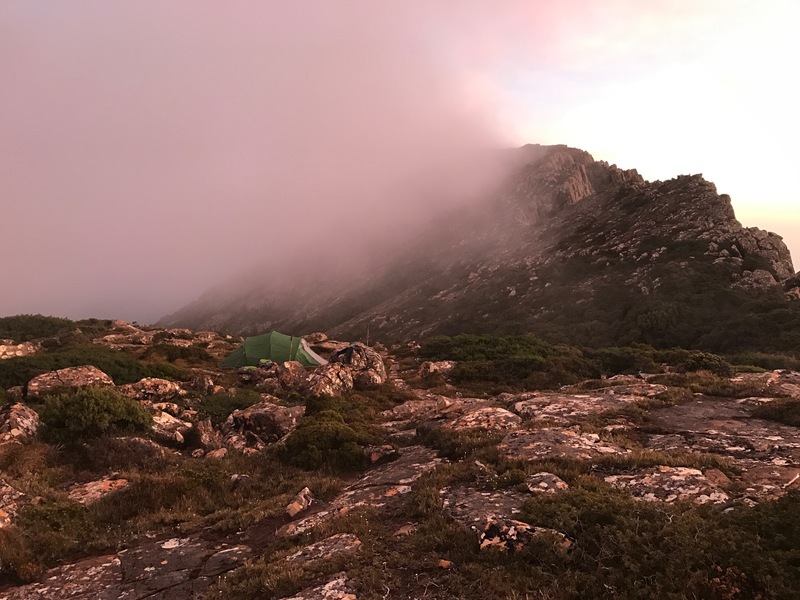 I recently was fortunate enough to do the Southern Ranges over the Christmas New Year Period in some pretty bleak weather. It was still amazing. I guess I'm currently pretty tuned in to other posts about the area so I had a look at your production Within Shadows of PB Part 1. I was a bit confused particularly around the 49-55minutes. Just wondering about your camp time at Whylly Plateau and your need to light a fire there? Your production shows that you arrived in sunnytime and appears to suggests that everything amongst your was drying out and the fire obviously provided no real warming properties other than a mood scene. 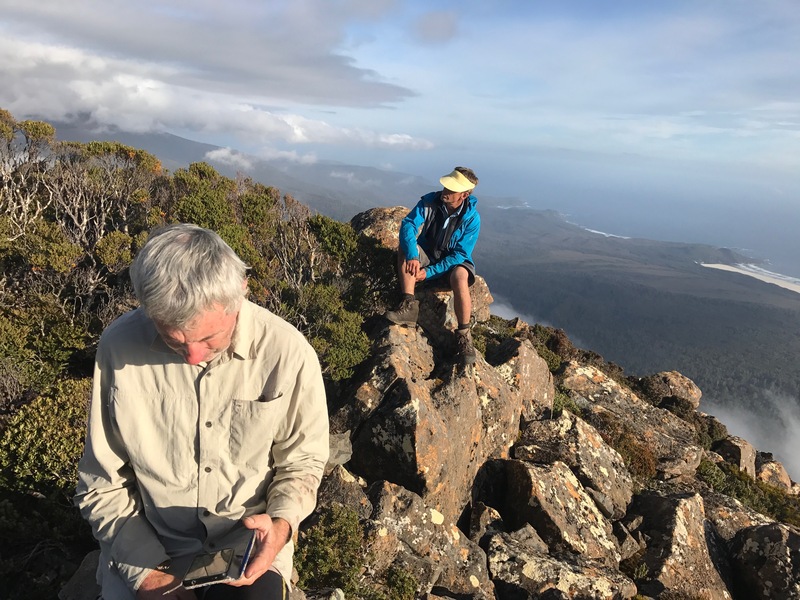 I understand that The Southern Ranges are part of the South West Nation Park incorporated into The Tasmanian Wilderness World Heritage Area. These areas and some other parks have been declared Fuel Stove Only Areas. This is because environmentally damaging bushfires have started from campfires. Many of the unique vegetation communities within reserves are highly sensitive to fire. Campfires can also lead to local environmental degradation around campsites. Fines of up to $5,000 can be imposed for lighting fires in such areas. 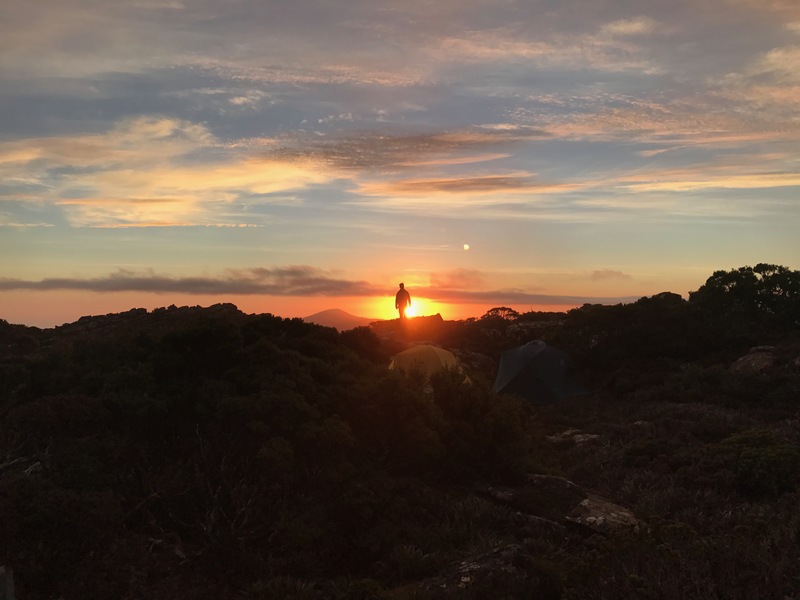 With a fuel stove you will not need a campfire, so there is no risk of your fire burning down into the peat soil, or of sparks blowing away to start a bushfire. Lookingoverthere wrote: Just wondering about your camp time at Whylly Plateau and your need to light a fire there? It's really disappointing to see how many people choose to ignore this law. In recent years it seems to be getting much worse too. Used fire places seem to be everywhere. Ignorance? No excuse! Very poor form and well done bringing it to attention. Harsher penalties need to be enforced to deter people from even considering the thought. Lookingoverthere wrote: I guess I'm currently pretty tuned in to other posts about the area so I had a look at your production Within Shadows of PB Part 1. I was a bit confused particularly around the 49-55minutes. Good point, no need for fire, but did they? Took a look but it wasn't clear. Screenshot? There's a definite fire going in the video. Around 50-52mins. That's no good relaxtec, take an extra canister for the stove and stand staring at that? Good spotting. Not sure how that video slipped in there. That was actually at Ida Bay Campground before the hike. I better fix that up. Day 2 - Pigsty ponds to Leaning Tree Saddle? Day 6 Osmiridium to Lion Rock - 9 hours? Do you think this is possible? Where would you camp after Pigsty Ponds to get to PB? If the weather is bad I would use Low Camp rather than up on PB. leaning Ti tree Saddle is ok but again very exposed. Also is the track actually open? norts wrote: Also is the track actually open? Nope, the Moonlight Ridge Track is closed until further noticed. It's not on the list of recent reopenings. If it were open... I did this back in the mid 2000's. Day 1. To Pigsty Ponds. The longest days are probably day 1 and day 6. The lagoon only takes 3-4 hours from memory so its feasible to descend PB and walk the lagoon in a day. The biggest thing I noticed doing the walk again almost 10 years later is how much the scrub has receded. I ripped all my clothes to bits on the first walk, second time I barely needed gaiters and came out with barely a scratch.